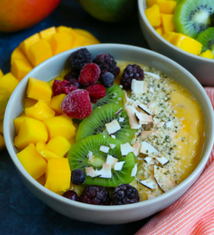 Use fresh mango slices to pre-make smoothie packs for easy breakfasts during busy mornings. Simply slice your favorite fruits, add some greens (for extra healthy-boosting yumminess!) and then divide them between individual baggies. Place baggies in the freezer and have them ready to dump into your blender when you need a healthy breakfast in 2 minutes FLAT.